In a close, cutthroat presidential race (some call it the most controversial presidential race in all history of the US), President Barack Obama won a second term as Commander and Chief of the United States of America. Troubles and complications at polls across the nation delayed results and had those watching the election unfold more on edge and nervous than ever. In the end, Barack Obama’s campaign, which zeroed in on key battleground states, proved effective and then some, as he won a majority of them (Iowa, Ohio, Wisconsin, Virginia, New Hampshire, Nevada and Colorado). Republican opponent Mitt Romney did managed to win North Carolina. The Republican campaign did too little, too late in the end, and strategists claim that his campaign seemed to virtually ignore large states like New York, California and Illinois. Despite the country’s current state of affairs (which the President inherited from Bush II): an almost 8% unemployment rate and a tumultuous economy, Americans weren’t detered on election night, giving President Obama a second turn at bat. “This happened because of you. 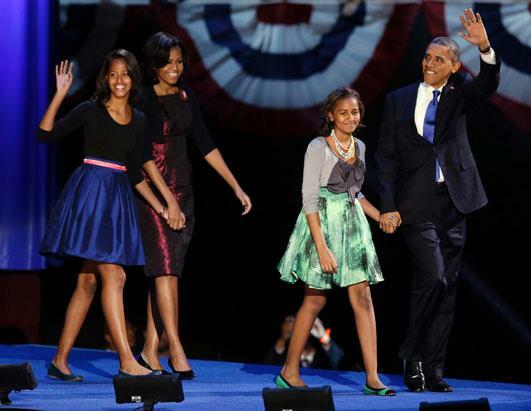 Thank you” read President Obama’s tweeted to America on election night. The exit poll revealed thta 53% of Americans see President Obama as more in touch with the people than Mitt Romney. Congratulations, Mr. President!